One Ghana, One Voice: Interview with Billy Kahora, Managing Editor of Kwani? Interview with Billy Kahora, Managing Editor of Kwani? This interview, the second in our series of interviews with the founders and editors of African literary websites and journals, features Billy Kahora, whose Kenyan outfit, Kwani?, is much more than simply an online publisher - it is a national literary institution, encompassing a print journal, books, website, local events, and more. The interview was conducted by Ngwatilo Mawiyoo. Ngwatilo Mawiyoo: Did you always know you would be a writer growing up? Billy Kahora: No, I didn’t know I wanted to write when I was a kid, I just read a lot ‘til I was in my teens. When I couldn't find anything to read that satisfied my curiosity, anger, and admiration for all the things I was seeing and experiencing around me, that's when I thought about recreating my immediate conditions. I did it for fun until things seemed to get worse around me like they do for all teens. I realized then that I had to take this 'replication' of my surroundings a bit more seriously. After that writing became my default way of trying to explain the world, life and all else. The denial that this is what I wanted to do went on for a long time and still goes on. Mawiyoo: What was your first published piece (and where did it appear)? Kahora: My first published piece came out while I worked as a freelance journalist in one of the small Lifestyle magazines that proliferated Nairobi in the 90s and are now dead and gone. A more significant moment was when I won a short short story competition at the Grahamstown Writers Festival when I was a 3rd year student in Journalism school. The story was called"he Boy At The End Of Sand" It was 200 words. Mawiyoo: What was your university experience like? What did you study? Kahora: I studied Journalism at Rhodes University in Grahamstown, South Africa. I’d left Kenya to become a writer. Everyone had told me that Journalism was a pretty handy career to try and use to become a writer. I would learn later that wasn't the case but through some stroke of luck I'd taken up English as my second major in addition to Journalism. It would prove priceless for my writerly ambitions. I discovered creative non-fiction in my final year. It opened up all sorts of new possibilities. South Africa at the time was barely a decade out of apartheid and many fine examples of creative non-fiction were emerging that told the immediate and difficult realities of South Africa, which were not too different from what was going on at home. It was a kind of 'social reality' apprenticeship that showed how knowledge, theory, and writing craft could be used to good effect on the continent. All the things I learned in theory came to life in the crucible that was South Africa at the time. Mawiyoo: How did you get hired for your current position? Kahora: I kind of grew into it as the organization was growing. I sent a story to Kwani? in 2003 when I was still an M.A Media Studies student. The Founding Editor, Binyavanga, liked it. I did not hear from him till I got back to Kenya in late 2004 though – I’d been away for seven years. When I met him to discuss the story, we started talking about Kenya, writing, the two issues of Kwani? that were out, and creative non-fiction. I told him that too much that was being published then – including some of the work in the first two editions of Kwani? – was detached, 'objective' in the narrative voice of bygone educations, privileges and entitlements. I felt that Kenyan language had taken a significant shift; mass 'reality' seemed to bend English, Kiswahili and our other African languages. I argued that different forms of creative non-fiction could serve us in the formalizing and telling of our often oral, informal and disjointed common stories in all their subjectivity. Binyavanga challenged me to get something practical going based on that little speech. At the time the Munyakei story had just emerged through the Bosire Commission. Judy Kibinge, a friend of Binyavanga's and of Kwani?, was doing a documentary, and so I set out to tell his story in print with all this new access to which Judy was privy. Mawiyoo: What are your greatest concerns as an editor and writer? Kahora: The general lack of [literary] tools in the material we receive. When present, those with these tools seem disconnected from local realities, narratives and expressions. One specific technical question I've being trying to grapple with for the last few years is the dearth of 'honest' voice - that which brings forth a real subjective experience located in our idea and experience as a space but understands literature as an artistic register with aesthetics, technical rules and a larger vision. It is often ‘either, or.’ Many writers have access to interesting subjective experience but hardly understand the aesthetics of literary narrative. Those who seem to grasp the latter might well be writing from Mars - which is actually fine - if you are in Mars. (Please understand that my comments are written with a certain bias for literary mimetic representations). Mawiyoo: The Kwani Trust was, for a long time, seen as the sole contemporary publisher of Kenyan writing. The Kwani? journal still remains the sole literary magazine in the country, which must put pressure on the magazine to be all things to all people. Is this pressure real for you? If so, do you ever feel the need to contend with it? Kahora: No, we feel none of that pressure. The pressure we do acknowledge comes from trying to be what we've decided to be in the face of many people wanting us to be what they want. The pressure we feel is really about remaining relevant, maintaining and raising standards and discovering new creative voices. Mawiyoo: How do you decide what direction to take for the annual issue? - What are ongoing Kenyan/East African realities that require an in-depth, creative take that wouldn't otherwise exist? - What are the major concerns of the contemporary creative and artistic community that cannot find an outlet anywhere else? - What are the major aesthetic and technical measures that we think are needed within the region? - How practical is it to put out an issue of that particular topic? Is there funding? Are there a few key signature pieces that will carry the issue? Mawiyoo: I understand that you're working on a novel called The Applications and 'a book about Juba'. Please tell me what they're about, how they're coming along and about your process as a writer. Kahora: The Applications is a novel about a middle-class Kenyan woman who slowly degenerates mentally with the decline of a certain middle-classness that existed in the 90s in Kenya. She loses her mind and her family only to rediscover another life in which she can live on her own terms as a popular religious leader. The novel is split into several sections told by other members of her family, her husband, her two sons and a daughter. I'm one section away from a serious first draft. I started it seriously in 2006. I have been thinking about this last section since August 2013 and I'm hardly there yet. Regarding the book about Juba, I travelled to Juba a few years ago for three weeks to write a small non-fiction book about an emerging city. I travelled with some well-laid plans, which helped with my enthrallment of the place and I quickly wrote half of the book and then realized that I needed to make another trip and finish the book there with my newly processed knowledge. The book needed to come from my living and breathing Juba. I'm still trying to take that trip and finish that book. Mawiyoo: Binyavanga Wainaina and Yvonne Owuor are two notable writers who’ve been published by Kwani? in the past and have gone on to publish a memoir and novel respectively with mainstream “Western” publishers. There’s been some criticism by Kenyan readers that the work is edited for Western audiences and somehow betrays African publishers and markets. As a publisher and writer, would you say this is fair criticism? How does one strike a balance? Kahora: There are two separate issues here: money and audiences. Writers need money just like, say, runners or academics who go to run in Berlin or teach in New York. Many writers feel they have limited options: the truth is that local publishers are notorious for mishandling writers and their works, even when they have money. Western publishers, like all publishers, are in it for the money and so they fashion manuscripts according to their perceptions of their markets. There's nothing wrong with that, that's just good old fashioned supply-demand. However, a book is more than a commodity, at least to some writers and the local audiences who raise such concerns. I always fall back on Sembene Ousmane's quote, "my markets are in the West, and my audiences are local." That's much tougher to say than actualize. The real problem for me would emerge if I pandered completely to Western capital without any other considerations. One option that is emerging is holding local rights when you have sold the rest to Western publishers. That way you can make the money out in the West with a publisher based out there but at least control what is being produced for your local market, by either self-publishing and distributing or getting a local partner. Note that one's book has more chances for local recognition if it is universally (read: Western) acclaimed. Mawiyoo: Your book, The True Story of David Munyakei, and Kwani? 5.1 and 5.2, which you edited, offer unique accounts of two critical points in Kenya’s history: the Goldenberg scandal of 1992 and the 2007-2008 post-election crisis, respectively. What do you see as the work of creative non-fiction in the Kenyan context? Kahora: One key role of creative non-fiction is to open up key aspects of Kenyan and regional history in creative and accessible ways for as many people as possible. Without creative non-fiction or even fiction, many of these issues remain ephemeral TV or social media sound bites, academic papers on some dusty shelf, great media analyses that are only accessible to the educated and professional classes. Though the greatest part of these kinds of historical moments remain in popular memory and public oral spaces, creative non-fiction offers the closest written record of just that. I've been watching, talking and reading about The Westgate Mall terrorist attack in the weeks after it happened and just comparing anecdote, rumor, supposition and all that's being written. There are few forms beyond either fiction or non-fiction that can try and collapse the two so that we can start a truthful recreation of what happened. Some of the more compelling investigative TV accounts are using the story telling and performative element formats in the reportage. Mawiyoo: Finally, do you remember this story that appeared in the newspapers a few years ago (about how a man survived being eaten by a python)? I heard about it because the Concerned Kenyan Writers group discussed the story. I think it was Binyavanga who half seriously concluded that it’s no wonder fiction seems irrelevant in Kenya, since reality itself is so far out! With your fiction writer hat on, what do you think is the work or potential of fiction in Kenya? Kahora: Reality is not only far out in Kenya. It is far out in Mpumalanga, Western Virginia, North New Zealand, Chenai, Chernobyl. Do you know how many people survive being eaten by anacondas in South America? Great fiction is not written in places where reality is 'far in'. Fiction is written in places where people have a grasp on language (both written and oral) that is highly relevant to the material conditions of the society they live in. It’s written in places that have a storytelling tradition that has internalized that society's culture and economy within the same language(s). Billy Kahora is the Managing Editor of Kwani? His writing has appeared in Granta, Kwani?, Chimurenga and Vanity Fair. Billy’s short story, "Treadmill Love", was highly commended by the 2007 Caine Prize judges. 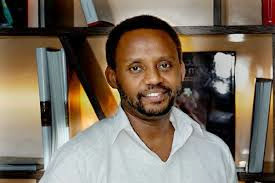 He is the author of The True Story of David Munyakei, a non-fiction novella about Kenya’s biggest whistleblower, and screenwriter for Soul Boy, a Kenyan film that was nominated for 5 African Movie Academy Awards. Billy was a Regional judge for the 2009 Commonwealth Writers’ Prize. Ngwatilo Mawiyoo is a poet and writer, currently based in Vancouver, BC, where she is a student at University of British Columbia’s MFA program. Her book Blue Mothertongue (2010) explored matters of identity in urban spaces and the African diaspora. Her album “Introducing Ngwatilo” (2011) showcases some of her solo work and musical collaborations. She interned at Kwani Trust in 2008.